Neither am I. I just love these little guys! They are packed with all sorts of good-for-you stuff, and just happen to be delicious. These buttery little beans (beans? they are in the bean family, right?) are about as versatile to cook with as they are easy to make. They are also incredibly inexpensive, particular if you buy them in the bulk section. Actually, the first time I ever bought lentils was last fall when I used them as part of my “autumn decor” (if you could even call it that). I bought yellow and red lentils, then just layered them in some mason jars with a candle in the middle. I only started cooking with lentils about six weeks ago! Speaking of fall, I’ve been trying to ignore the fact that my beautiful morning light will be going away soon but soon I’ll have to face facts and figure out a method other than getting up at the crack of dawn to take photographs of my recipes. Do you have any ideas? Also, I just confirmed the legume-status on Wikipedia, so at least we have that part down. So, tell me. 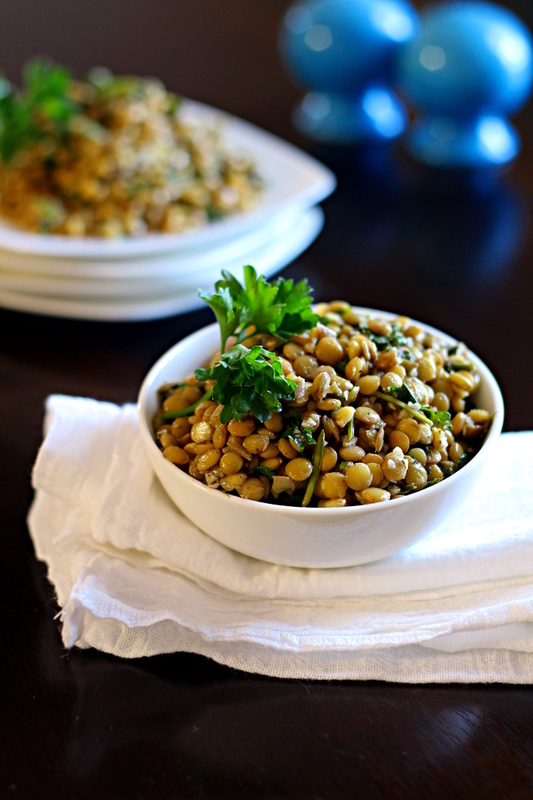 Why haven’t you jumped on the lentil bandwagon yet? Do you dislike protein? Fiber? B-Vitamins? Do I sound like your mother yet? Just get with the program. Cheap, fast, delicious, and healthy. That should check off just about every item on your list. Oh, lentils. You complete me. Measure out your lentils, place them in a fine mesh strainer or colander, and rinse with cold water. Sort through the lentils to pick out any stones or debris which may be left behind. 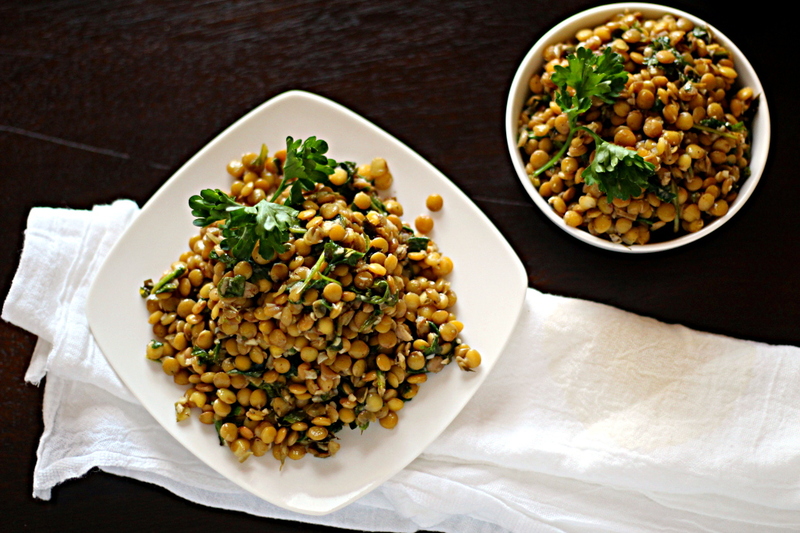 Place the rinsed lentils in a medium sauce pan and add 2 cups of water. Bring the water to a rapid simmer over medium-high heat. The water should be moving, but it shouldn’t be a full-on rolling boil. Turn the heat down to medium-low and cook for between 20 and 30 minutes. You want the water to maintain a soft simmer. Meanwhile, finely mince 8 cloves of garlic in a food processor (or use a sharp knife). Heat the grapeseed oil in a small skillet over medium-high heat until a small piece of garlic sizzles at once when tossed into the pan. Reduce the heat to medium-low and add all of the minced garlic. Saute until the garlic is golden brown and crispy (about 6 to 8 minutes). Set aside. Chop up your fresh parsley, mint, and arugula. Set aside. In a small bowl, whisk together the olive oil, lemon juice, cumin, allspice, salt, and pepper. 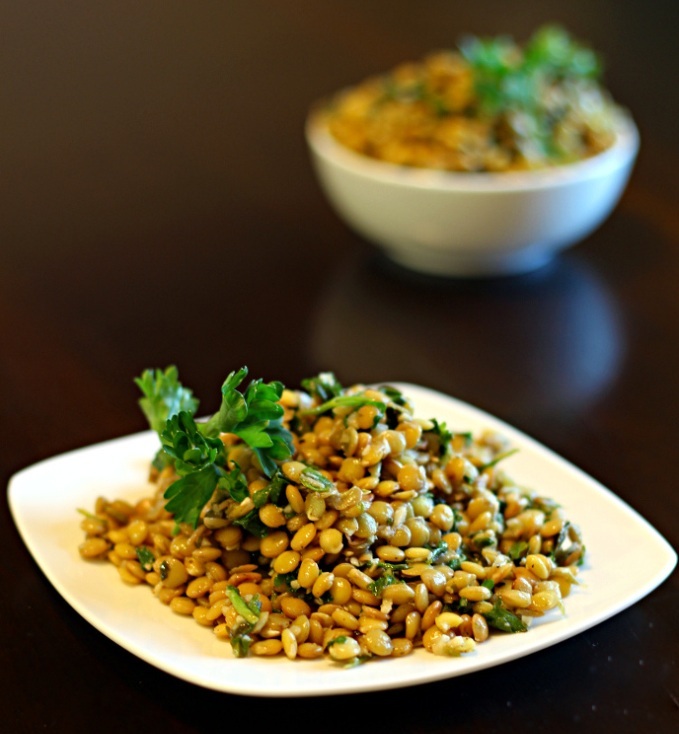 Once the lentils are tender, remove from heat and drain any excess liquid. Return them to the pan and add the crispy garlic along with the mixture of olive oil, lemon juice, and seasonings. Toss well to coat. Fold in the fresh parsley, mint, and arugula. Taste and adjust salt and pepper as needed. Tasty lentils! Used them as the bed for some grilled garlic chicken. I used baby spinach and cilantro instead of arugula and parsley, respectively, because that's what I had on hand. Thanks! Man oh man, I love me some lentils.